C.J. 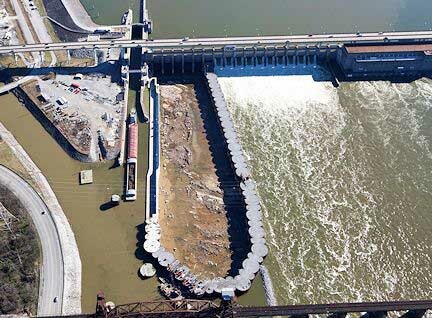 Mahan Construction Company was the prime contractor for the construction of the cofferdam for the Chickamauga Lock Replacement. 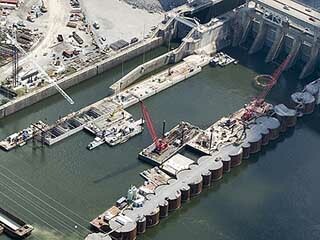 This project involved construction of a 50-cell temporary cellular cofferdam, as well as approximately 850 lineal feet of concrete filled segmental precast cofferdam that will ultimately form a part of the future lock wall. 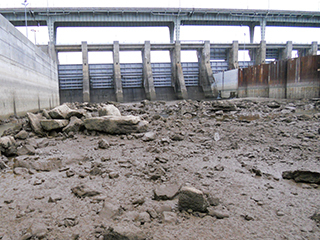 Approximately 12,690 cubic yards of concrete were placed by the tremie method, with individual placements ranging up to 3,100 cubic yards in size. Mahan self-performed the installation of 75 drilled shafts, including two 74” diameter Technique Shafts and 73 each Production Shafts with shaft lengths ranging from 35′ to 56′ in depth and were drilled from a floating platform. Mahan also implemented a redesign of the coffer-boxes that would allow each box to be formed as a single unit on modular barges that were then floated into place and lifted into position. The 16 coffer-boxes varied in size from 41′ to 65′ long are 38′ wide and 25.5′ in height and weighed as much as 300 tons. 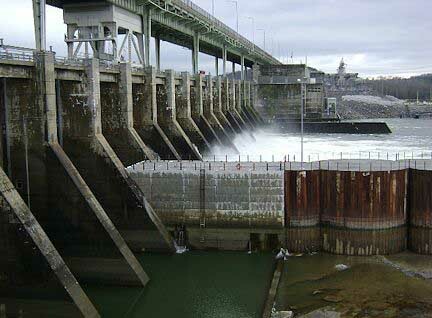 Concrete for the job was produced from an on-site batch plant erected and operated by Mahan. 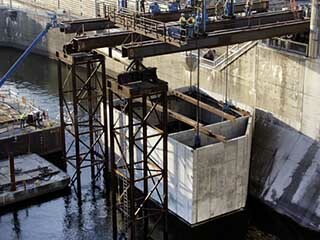 Concrete mix designs were developed on-site by Mahan’s staff for the Drilled Shafts, Tremie Mix, Infill Concrete, Precast Coffer-Boxes, and the Formed Concrete structures that make up a portion of the future lock wall. 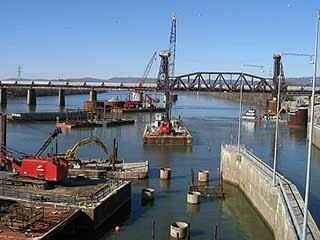 Construction was completed entirely from floating equipment on the water.